Which Rolex Watches Have Increased Most in Value? The year is 1963. You have saved up somewhere around $255 and have decided to treat yourself to a Rolex Datejust. Wandering into your local jewelers, you get the strange feeing the salesman is doing his best to steer you away from your original choice and seems hell-bent on directing your attention to one of the new arrivals in his store. The Daytona has just landed, Rolex’s first real attempt at a chronograph, brought out to try and claw back some ground from rival brand Omega and their all-conquering Speedmaster. It is a nice enough looking piece, and there certainly doesn’t appear to be any shortage of them available. In fact, the shelves are positively groaning under the weight. What’s more, the salesman, with a slightly manic look in his eye, is prepared to offer you an extremely attractive deal if you will take one off his hands. You examine one out of politeness (the standard model; the so-called ‘exotic dial’ examples are a bit too out there even for the ‘60s) and ask the one question the vendor really wishes you wouldn’t. Yes, he admits, it is a manually-winding movement. You leave with your automatic Datejust, having successfully dodged a bullet. If there was ever a case for building a time machine (other than, you know, stopping Hitler and stuff) it would be to go back and prevent yourself from making decisions like that. Had you opted to make an offer on the ref. 6239, the very first Cosmograph Daytona, kept it in half decent condition and looked after the box and papers, it would be worth a minimum of $50,000 today. This for a watch that, if certain stories are to be believed, was such a poor seller that several dealers were literally giving them away as a sweetener with the purchase of some of the more popular choices. If you had bought yourself an exotic dial model, what is universally known as the Paul Newman version, you could be selling it on now for a sum way into six figures and beyond. It is a fact that certain Rolex watches have increased in value to an almost insane degree and it is, of course, the ones no longer being made which command the highest prices. Like antiques, their value comes from their rarity and the finite supply of them doing the rounds. The models still in production can only increase in price a limited amount, as those who want one can always secure them through an Authorized Dealer. Or, at least, that’s the theory, and we can look into that a bit more in a minute. Although Rolex has a well recognized history of producing fine precious metal watches, it is the steel sports models which perform best in the long run as far as price increases are concerned. First generation examples of the Submariner or the GMT-Master, the Sea-Dweller or our Daytona reach extraordinary figures at auction. Bought new in the 50s and 60s, they would have cost only a few weeks wages of the average income. By comparison, something like a gold Day-Date or Datejust had a far higher initial buy-in price, and didn’t have the widespread popularity of the professional collection; consequently they have never been in as high demand. But you don’t even have to go that far back in time to find a Rolex that would have made a great investment. If we take the Submariner as an example, in the mid-90s you could pick up a ref. 16610, thought of by some as the last of the greats before the Supercase was introduced, for around $3,350. With inflation, that translates as a little over $5,000 in today’s money. If you had held onto it, you could have sold it on the current pre-owned market for anywhere from $6,000 to as much as $10,000. Even though they have been around for well over a century, Rolex has never been more admired than it is today. Each new release from the company is greeted with a near hysteria, and it is still the sports watches that remain the most coveted. The first steel Daytona to be given a Cerachrom ceramic bezel, the ref. 116500LN, instantly became thewatch to own when it was launched in 2016. Last year saw the arrival of another, the Pepsi GMT-Master II, its blue and red bezel causing so much misty-eyed nostalgia they sold out before most people even got to see one in the flesh. And therein lies the problem. Since the time Rolex went from being the makers of tool watches to becoming the ultimate lifestyle brand, just about the beginning of the 1980s, the maxim at HQ has been all about exclusivity. In order to maintain it, they have controlled the supply of their most sought after models so tightly that the demand for them is incredible. Waiting lists at Authorized Dealers for the most desirable pieces are years in length, and it has given rise to a new breed of shady dealing. Individuals with connections in the industry and massive buying power are snapping up numerous examples of the biggest hitters and selling them on to desperate collectors at huge profits. It is not unusual to see New In Box Pepsi GMTs going for literally twice their retail price these days, and fans clamoring over each other to pay it. Daytonas and Subs are not far behind, and even at these significant markups, they still represent some of the most rock solid investment opportunities in horology. People will alwayswant one. But what if you don’t have the same kind of budget, yet still want a Rolex which will increase in value? The best advice will always be to stick with the professional range, and the steel versions if possible. Two models well worth considering are the GMT-Master II ref. 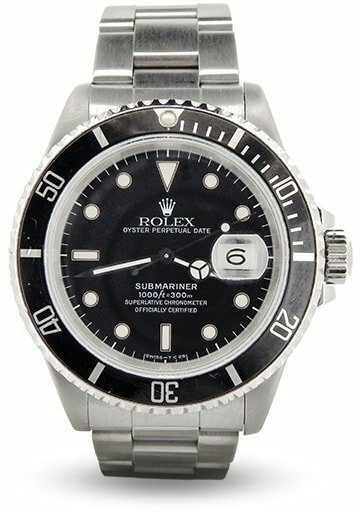 116710BLNR, better known as the Batman, and the Sea-Dweller Deepsea, the ref. 126660. The blue and black GMT was the first example of the iconic travellers watch to have a bi-color ceramic bezel, and the color scheme has attracted legions of admirers. But more importantly than that, it has only recently been removed, very quietly, from the Rolex website, indicating that production is going to stop soon. Snapping one up now could well pay off. And the Deepsea has never been a big seller for Rolex, but has been given sizeable price rises over the years, with more predicted in the future. They, and the Caped Crusader, can be bought as new on the pre-owned market for more or less retail price at the moment. At BeckerTime, we would never advocate buying any Rolex simply because you think it might increase in value in the future. Rather, it should be because a particular model appeals to you, through its design, its heritage or whatever. That being said, no other watch brand, with the possible exception of Patek Philippe, represents as safe a bet investment-wise as the crown. As we have seen, there are certain vintage examples which have become so desirable among collectors that buying them now requires a massive outlay. The real trick is being able to spot which of the latest crop might follow suit.